I used to love watching TBN, I mean who didn’t love seeing Benny Hinn swing his jacket like a lightsaber, “healing” people left and right, whilst they’re knocked to the ground by the Holy Spirit. Well to me it was a lot more entertaining than the WWE, wrestling lost its luster when WCW sold out to the McMahons. The one thing that I always wondered was, why the TBN holy rollers never healed anyone with a visible ailment? But anyway I digress, what I’m supposed to be elaborating on is these new age channelers. I remember when this dude I know first introduced me to Bashar aka Darryl Anka à la youtube. I watched this dude in utter disbelief. OK, so dude claims he’s channeling a being from the future, who also happens to be hybrid grey alien. Personally, I don’t believe in time travel, it doesn’t make any sense. If I am here in the present moment, how are you going to interact with me simultaneously 20 years in the future if I am in the present moment here and now? The only way it could be possible is if there is another accelerated alter-dimension that doesn’t really exist, except in a dream-like state that plays out our decisions we make in the real world. Why the hell would an alien hybrid be sitting around in future earth waiting for Darryl Anka to summon him, so he could make non-sensical speeches in front of paid attendees? Anyway, I listened to the whole video, and yes it was more entertaining than the WWE. So to tickle my fancy I started to youtube other channelers and I discovered there are hundreds if not thousands of them claiming they are channeling the likes of The Arcturian Council, The Creators, The Founders, Archangel Gabriel, The Hathors, Jesus, Buddha, St. Germain, The Pleiadian High Council of Seven, Quan Yin, Ophelia, The Zetas, The Quarnthians, Mother Mary, Archangel Michael, Plaideans, Atlanteans, Jehovah, Abraham, Egyptians, Grey Aliens, Reptilians, Mermaids the list goes on and on. After listening to dozens of these channelers I sat back in my chair in amazement, I really didn’t know what to think or say. But let me tell you this, I’m a spiritualist and I’ve had many unbelievable experiences with the spirit world. Channeling is a new age way of saying someone is “mounted”. In aboriginal cultures, including the pre-Christian Europeans, mounted meant that spirits and other dimensional beings use their body as a temporary host to be able to interact with us in our reality. In aboriginal spiritual traditions, it takes many months if not years to learn how to properly allow another being(especially the right being) to temporarily use their body as a communication mechanism. To properly open the door or gate to the other realm as to allow spirits or multi-dimensional beings to mount people can take hours and is usually accompanied with certain sacred sounds or music, sigils, rhythmic movement, chants, and sacred “attracting” aromas. But somehow these modern day Voodoo gurus calling themselves channellers circumvent all of this and can summon a being from Arcturus( a star) which is 40 light years away in 20 seconds on youtube so they can start telling you repackaged new age mumbo jumbo. The dangerous aspect of channeling is you have thousands if not millions of low vibrating, disembodied spirits and demonic entities who would love to play peek a boo into our world. They will lie and tell you anything you want to hear and pretend to be anyone you wish them to be as long as you allow them in your aura and your mind. Some of them can become parasites and can be quite difficult to extract from the host. Most of these people on youtube claiming to be channeling look like they need to be committed in an institution. Many others are just new age televangelists that have found a new way to line their pockets without being behind a pulpit. Very few of them seem to be authentic or offer any knowledge of any value. There’s a few that I do like such as Taryn Crimi, I like the information she disseminates. The other thing I noticed is most of them do not speak “normal”, it’s like they’re purposely using a mode of speech that is hypnotic or confusing while throwing around rarely used vocabulary to confuse their unsuspecting devotees. I also noticed they all say the same thing, they constantly repackage information from pioneering authors like Penney Pierce, Katrina Raphaell and Dolores Cannon. These channelers will not tell you anything of value, it’s just the same ole flowery imaginative versions of “see yourself in an orb of white light”, different variations of The Law of Attraction, while also petting your ego. There’s this one particular channeler Micheila Sheldan who piqued my interest, I listened to quite a few of her videos until I came to this one video. About halfway into the video while she was still “channeling” one of the guests asked,” what is the cure for cancer“. All of a sudden her voice changed, she stumbled over words with psychobabble, then she replied ” the cure for cancer is in another dimension, and that humanity as a whole must download the cure into our physical reality”, that’s when I stopped watching. So none of these “superior beings” know that black seeds or black seed oil cure cancer? See my article on “The magical health properties of Black seeds“. I’ll tell you what started me on my quest to finding cures for so-called “incurable diseases”. Periodically I have spiritual experiences called visions, but once in a blue moon just before I awake I’ll hear a voice from my spirit guides tell me something of incredible value. This one particular morning the voice told me “what’s in lemon peels cures cancer”. When I awoke, I didn’t know what to think because I had never encountered data reflecting this. So I searched PubMed and to my surprise there were many research articles such as this one “d-limonene exhibits antitumor activity by inducing autophagy and apoptosis in lung cancer“, stating that the compound d-limonene in lemon peels kill cancer cells. See my article on “How to cure cancer naturally“. I told a friend of mine about this and she told me that she knew someone who was on hospice who juiced frozen lemons and became cancer free. With all that said I find it odd that of all these thousands of channelers on youtube cannot give humanity any information that will help us outside of typical new age spiritual mumbo jumbo and unverifiable information. So one day I confronted the dude who introduced me to Bashar and I asked him if all these “channeled” beings are here to aid and to help humanity, why don’t any of them tell us anything of worth like how cure to cancer, or how to develop free energy? Dude was clueless. 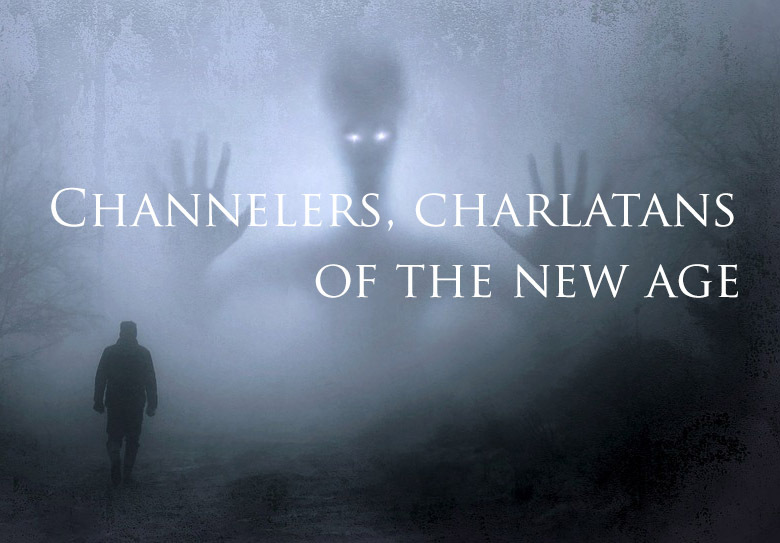 The last channeler I researched was Barbara Marciniak , a popular author who claims to channel beings from the Pleiades constellation. I didn’t watch too many of her videos, but I did find one of her books “Bringers of the Dawn: Teachings from the Pleiadians” to be quite interesting, I actually read the book free online here. The book is full of unverifiable interesting channeled information, some of which I totally agree with, but what I really loved is how she ended the book. She ends the book by warning people about the dangers of channeling other beings and instructs people to seek the knowledge from their higher selves instead of multi-dimensional beings, as the higher self is connected to all things and knows all things.